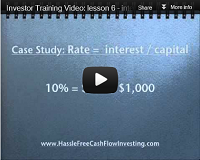 The following real estate math videos are a great tutorial to strengthen your investing skills. The Return on Investment is a calculation of how hard your money is working for you. We all want that number to be high, so let’s learn how to calculate it. 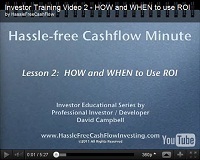 ROI = Profit / Capital Invested. 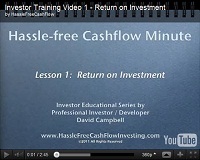 The more Profit you make with less Capital Invested, the higher your Return on Investment. $25 of Profit on a $100 Investment = 25% ROI. Note, this simple calculation doesn’t account for the duration of the investment. Now to determine How and When are the best times to use an ROI (return on investment) calculation. There are so many types of investments available, so to have a quick and easy way to compare them all, you can use the ROI. Annualized ROI is much more important than just ROI because it does account for the length of time your capital is invested. Interest Rates and most Investment Opportunities are offered as an Annualized ROI. GSI (Gross Scheduled Income) is the full income expected to be received assuming 100% occupancy at market rent with no rent concessions. It does not account for any expenses as well. AGI (Adjusted Gross Income) this is GSI minus the vacancy rate, rent concessions (leasing fees), and loss to lease (freeloader tenants). 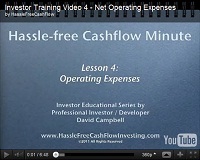 NOI (Net Operating Income) is AGI minus Operating Expenses. This is what you get to keep. Since Operating Expenses are a key part of calculating the NOI, it is very important to calculate this correctly. What are part are Property Taxes, Insurance, Property Management fees, Property Maintenance (not Improvement), Utilities, Landscaping, Entity Maintenance and Annual Filing fees, Accounting and Tax Preparation, and a Replacement Reserve. Note, mortgage payments are NOT included. 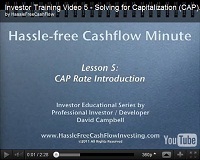 The CAP rate (Capitalization Rate) is the NOI / Purchase Price. 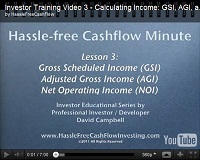 So, it is the annualized amount that you get to keep divided by the price of the investment. $5,000 NOI / $100,000 = 5 CAP. Yes, this is a percentage, so you could say it is a 5% CAP rate, but the cool people just say it is a 5 CAP. If you are offered a deal with a 5 CAP with financing in place versus a 5 CAP without financing in place, the actual cash on cash return could be substantially different, but that’s a different video (cash on cash return). The last real estate math formula is great if you know how much money you want to receive and the prevailing interest rates, then it will tell you how much you need to invest.